Lurline's Place: A Trumpeting Finish! 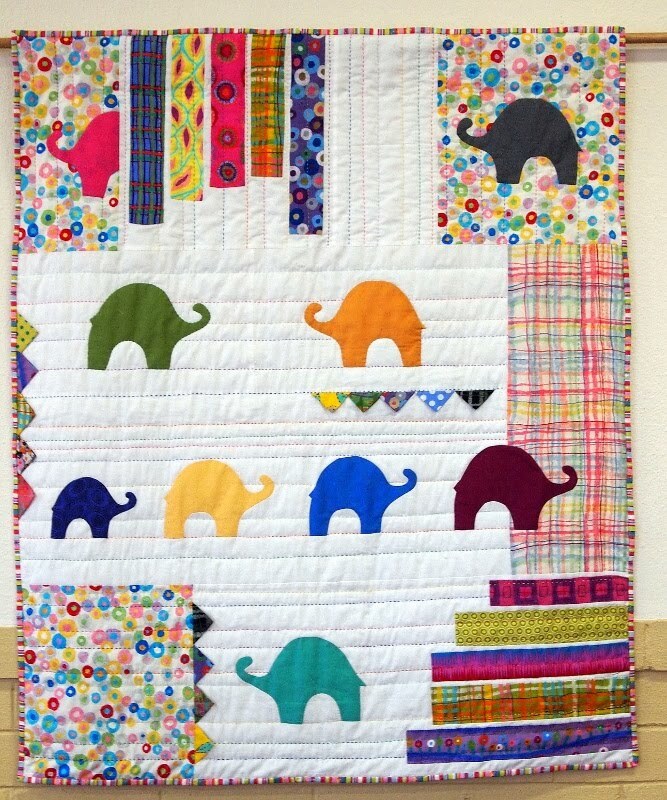 With a little bit of sadness and lots of happiness, my Elephant Quilt is finished! As I have said before, it was a great, fun quilt to make - I don't think I have enjoyed making a quilt so much - but then, they often say 'my latest quilt is my favourite'. And now on to other things - I must do some applique and I must prepare something for big-stitch Perle Quilting. I have a fun weekend ahead, here's hoping you enjoy yours too! So bright and cheerful! 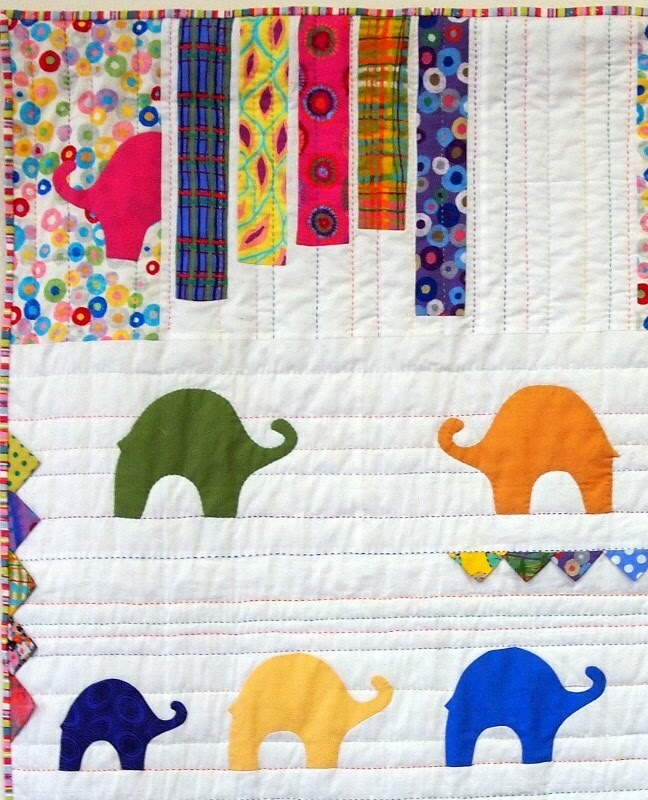 I love the elephants and all the fun colors and prints! Oh Lurline, it's my favorite too!! So bright and happy! Have a fun weekend. It turned out wonderful Lurline! Love those cute elephants. 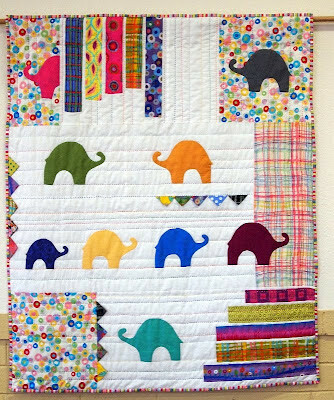 What a lovely quilt, Emily loves elephants and you should see her throw up her little arm and make the trumpet sound for an elephant, very funny. just sooooo adorable, maybe you just need to make another one and save it for next time you need a baby quilt! Just lovely Lurline as is everything that you make. Have a good weekend. A beautiful finish to your quilt the striped binding( I think it is striped)is perfect.It does look like it was fun sewing the elephants,such lovely bright colours. It's GREAT!!! I need to work in the garden, spring arrived here and the garden is CALLING me, so this weekend no quilting or maybe a litlle bit. How fun. I have yet to try the big stitch quilting with Perle cotton. What size Perle cotton thread do you use? And what size needle? I love how it looks and imagine it goes pretty quickly. It's wonderful! I love it so much -- so cheerful and colorful! This is such a fun quilt. I can see why it is a favorite. Just makes me smile. Those Elephants are gorgeous all lined up for an adventure. A really fun quilt. Beautiful work, Lurline. I just love this quilt Lurline! It's fabulous. Such a beautiful quilt!!! Love it!! !